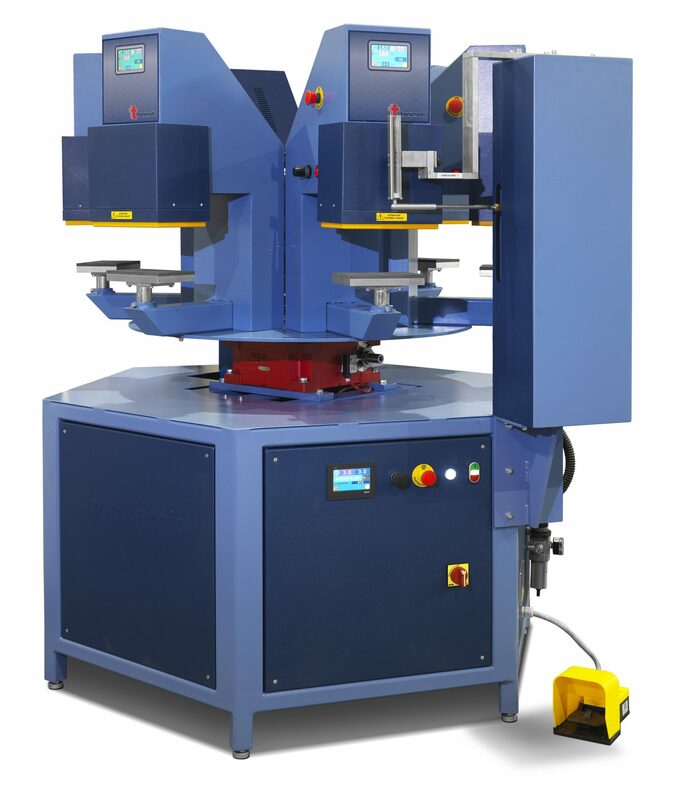 The CA 500 Carousel Heat Transfer Printer with 4 or 6 independently controlled pressing stations is suitable to print all kind of cutted heat transfers. Standard plate size is 15 x 10 cm, making this an ideal machine for the front label print or inside size label print of T-shirts, however other platen sizes are available. We realize the loading boxes on your designs and according the label size. Laser lights or special features are to be discussed and to be added in function of the customer’s requirements. The CA 500 is CE certified and will meet or exceed worldwide safety and efficiency standards. Time, temperature and pressure is set individually on each of the four or six press Heads. Actual esteemed reported production is 700 / hour T-shirts using 2 operators, a dwell time of 15 seconds and a rotation speed of 3 seconds.